I started a text message on my iPhone. The iPhone had been recently updated to IOS8. 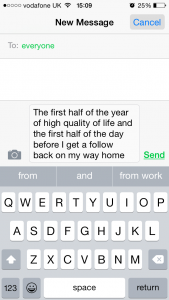 As part of that Apple overhaul there is a new predictive text system. Three choices of words are presented above the keyboard to assist in the creation of the text of the message. Normally I use this to bypass my unbelievably bad spelling and typing (that is if my input is close enough for the prediction engine to work out if its actually a word or not). 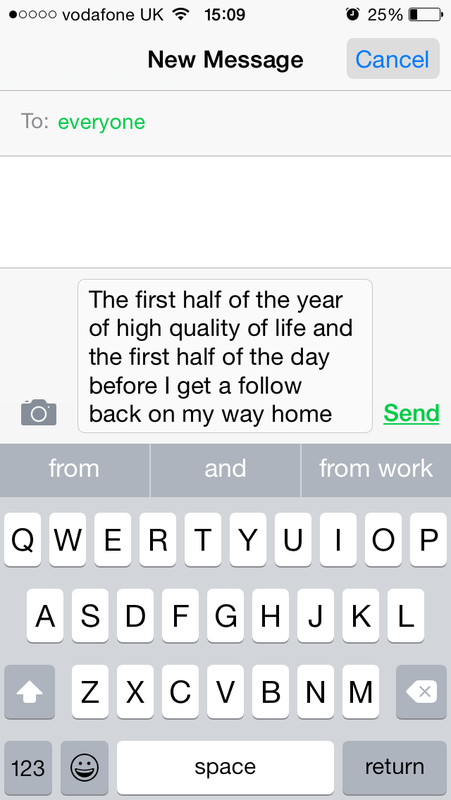 I started a text message by hitting the middle button of the predictive text – again, and again, and again. This is an algorithm at work. Trying to figure out what it thinks I want to say. Like most algorithms I suppose it is heuristic and haphazard, and naturally (unnaturally) doesn’t understand any of the language it’s processing remotely the way you or I do. I still rabidly anthropomorphise it’s output “it said this“. It also makes me wonder if there is intent hidden somewhere in there. Some programatic emotion embedded somewhere right in there, by its creator or creators. Its curated database soul. A performative thing, for sure. So I’m thinking about text again. About the way we make text, everywhere, all the time. We’re writing so much, in public and in private. And it’s not like it was before; these messages aren’t analogous to letters or telegrams, this is instantaneous and breaths in and out like conversation, like we’re actually there. I’m thinking about what Tim Etchells has said, that the meaning of text messages is a co-creation between sender and recipient. In particular I’m thinking about this because as part of a piece of research, I’m sat here texting people I don’t know. It hasn’t started yet. But it will soon. Last time I did this I got into a bunch of conversations (54 to be accurate). Some were abrasive, some funny and some well deep. There were jokes and relationship advice (both ways! ), Robbie Williams songs and trolling slurs. I didn’t have a clue who any of them were, these texters. For the project I used a new phone and a new SIM card, so all the messages were anonymous (to me). Later, when close friends discovered they’d been texting me it was all surprising and slightly awkward. Like we should have known each other by inflection and individuality of emoji use. There was always doubt as to the gender, age, sexuality, well basically *anything* about the person I was chatting to. So its finished now, iteration #2. This time I tried to make things a little more structured, to borrow and steal from other folk who have used text messaging as a performative space. I’m not sure it worked as well. Folk getting the same messages as each other felt it dispersed the supposedly special relationship. It probably did. In trying to conduct multiple conversations and concentrating on making them all unique, I took an inevitable shorthand and broke the spell a bit. Fourteen hundred text messages with thirty people over five hours. SMS has been characterised as the most hostile environment you can go to. ‘No picture, no sound, nothe most hostile environment you can go to. No picture, no sound, no font even’ (Benford & Giannachi, 2011). Not so true now, with emojii and the possibility of pictures, links and other mediations. Still pretty barren. “Look at what she’s said now” – overheard participant. And I’m still making sense of it utterly in context of me.